Home » Patient Centre » Blog » How often should you have a dental check-up? The dentists at Beenleigh MarketPlace Dental advise their patients when they need a check-up and clean on an individual basis. Every patient’s oral health is different. Some are more predisposed to certain oral health issues like periodontitis or oral cancer than others. This means they will require more regular check-ups. Attending regular check-ups and cleans is the best thing you can do for your smile, and can potentially save you thousands of dollars in the long run. The dentist can identify any potential issues early, and fix them before they turn into something more serious. During your initial check-up and clean, the Dentists at Beenleigh MarketPlace Dental will check for a build up of plaque, gum disease and discuss your dental medical history. Why is a dental check-up important? 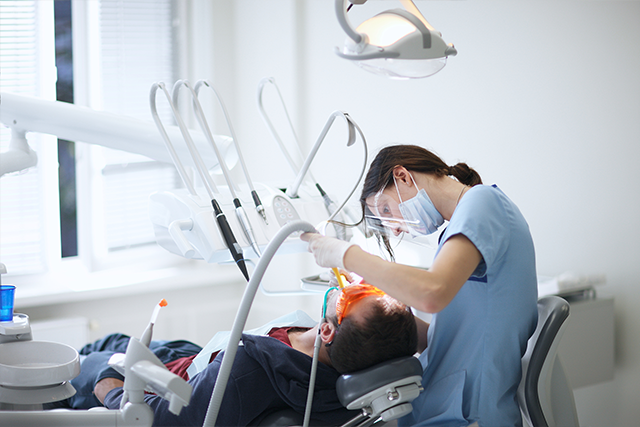 A dental check-up will allow the dentist to detect any problems. Leaving problems untreated can make them much more difficult to treat in the future. It’s best to deal with these problems early, or even better, to prevent them. Prevention of gum disease – A build-up of plaque can cause gingivitis, the early stage of gum disease and if untreated can progress to the more severe advanced stage of gum disease, periodontal disease. As periodontitis progresses, it can cause bone loss and create large spaces between the tooth and gum. Keep your teeth – Poor oral hygiene can result in periodontitis and the supporting bone can be destroyed as the built-up plaque moves further into the roots of the teeth. Brushing and flossing regularly between check-ups is essential. Preserve a white smile – Regular teeth cleanings will help remove surface stains on your teeth. Stains on your teeth can be caused by high-pigmented food and drinks, and some lifestyle choices, like smoking. Support your overall health – Recent high profile studies have linked gum disease to strokes, and even heart attacks. Although these studies are still in their infancy, regular teeth cleanings could potentially lessen your risk of having a stroke or developing heart disease. Prevent bad breath – Halitosis or as it’s commonly known, bad breath, is typically caused by sulphur-producing bacteria living on the surface of your tongue and throat. These bacteria sometimes break down proteins at a high rate and odorous volatile sulphur compounds (VSC) get released from the back of the tongue and throat. To ensure your breath stays fresh, its recommended you get your teeth cleaned at every dental check-up. So, how often should you have a dental check-up? After your check-up at Beenleigh MarketPlace Dental, the dentist will recommend a date for your next appointment. This will depend on your individual case and could be as short as three months up to a year. Speaking generally, if you have a low risk of dental problems the longer you can wait between check-ups. Patients with good oral health will attend check-ups approximately every 6 to 12 months, compared to a patient with poor oral health that will need more regular check-ups. Regular dental check-ups can spot issues you may not even know you have. Unless you have pain or discomfort, many dental issues may go unnoticed. At Beenleigh Marketplace Dental, their aim is to guide patients along the path of optimal oral health and wellbeing; for life. With regular dental check-ups they can help you make the most informed decisions about your personal dental treatment. If you have any questions regarding dental check-ups or would like to book your check-up in, contact Beenleigh MarketPlace Dental today.